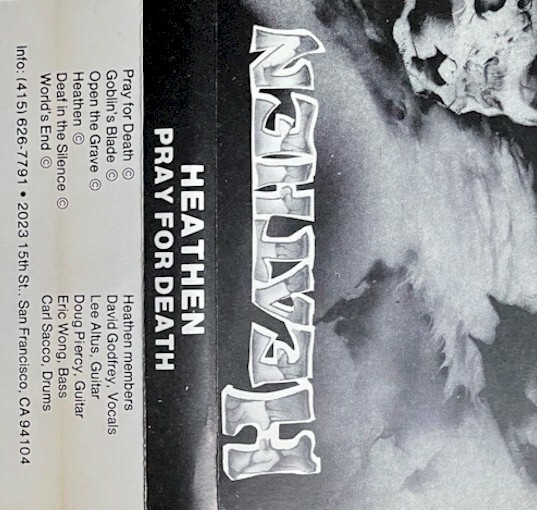 Heathen were formed in 1984 by guitarist Lee Altus and drummer Carl Sacco. Even without a bassist, this lineup played a single gig, on April 21st, 1985. Then, Jim Sanguinetti left to form Mordred and was replaced by Doug Pierce on guitars. Sam Kress, who was a better songwriter than vocalist, was kicked out in late 1985 and David Godfrey of Blind Illusion was asked to join. Bassist Eric Wong was added in early 1986, and the "new" Heathen's first gig was on February 6th. 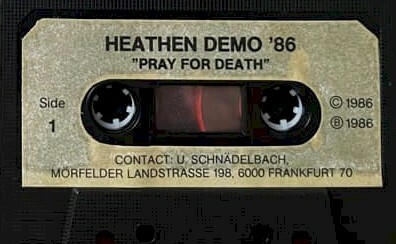 They recorded the "Pray for Death" demo in April, 1986, and then Eric Wong was replaced by Mike "Yaz" Jastremski from Griffin (US) in mid-1986. This lineup recorded the first album. Pro printed covers. Cassettes were pro tapes with nice stickers on the shell.